What will scientists think of next? And why am I not surprised that they waited until the day after April Fool’s Day to release this study. As a frequent flyer myself (British Airways Gold Guest List), I have so many questions. I know that fruit flies have a choice of airlines when they fly. Were there particular airlines whose aircraft interiors made the flies feel more like they were at home? 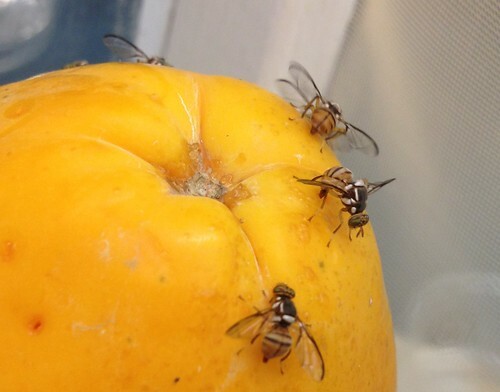 Which airports and airport restaurants do fruit flies prefer? Did their frequent flyer status provide them with lounge access, and if so, which lounges did the flies find to be the most welcoming? But seriously, it is April 2, not April 1. And possibly the researchers are on to something. They had expected the jet lag simulation to inflict additional damage to the brain, and were surprised when it seemed to help. The research team didn’t really subject flies to the full jet lag experience. Instead they altered the flies’ circadian rhythms two different ways. For one group of flies, the researchers altered the flies’ environment by changing the daily timing of light-dark cycles. This manipulation caused the flies to live a 20-hour day instead of a 24-hour day. And for another group of flies, the researchers mutated a gene that is well known for controlling the internal circadian clock. The team zeroed in on a gene that encodes the “heat shock organizing protein,” or “hop” for short. Not only is hop controlled by the body’s circadian clock, the gene is also responsible for protein folding. Because misfolded proteins can result in many different neurodegenerative diseases, Allada thought hop made an interesting target. He and his team knocked down the hop gene in flies with the protein that causes Huntington disease and — again — were surprised. Knocking down the gene restored the flies’ arrhythmic circadian clocks, reduced the aggregation of diseased proteins in the brain and reduced the number of neurons killed by those proteins.